Add a small animation when you're drinking potions just like Dark Souls. If there is anyone would like to translate it into other language, just do it. Manaflow for the permission to make and upload it. Drazhar753 for the idea and the file names. I'm not a native English speaker and I'm sure that I'll leave a lot of mistakes below, so I guess I have to apologize in advance. If there is anything you don't understand, just let me know. Here is the SE version, thanks to AcceleranDog﻿. ·Fix a few bugs and increase the compatibility. ·Increase the stability and safety. ·Add an option in MCM that can change the flee probability of NPCs. ·The drinking can be interrupted. The potion effect will not work after that, so now you can stop your enemies use the potions to heal themselves by shacking, knocking down, blowing away or something else. ·Add an option in MCM that make the NPCs drink slower (so that they can be interrupted easily). Wrong timing the potion effect works on NPCs. Be slow down after drinking when you are not fighting. ·Add the animation to NPCs successfully, now you can turn on the switch in MCM and see their drinking animations. ·Also add an option in MCM which make the NPCs can flee when they are drinking. 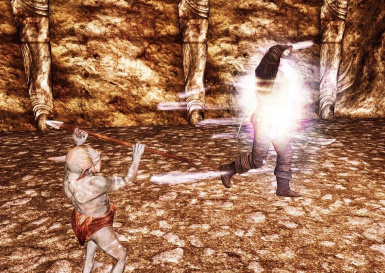 ·Add an option in MCM that can make the shield and staff (in right hand) can be invisible. This is an improved mod based on Manaflows "Potions Animated" . I've made a better animation file so that it becomes shorter and faster (1~2s). Just like Dark Souls, you only can walk while drinking. Tackled the issue that "get character's weapon force-sheathed before drinking a potionr " in both original and flee version( Drazhar753's "Potions Animated (Flee while you drink)"). 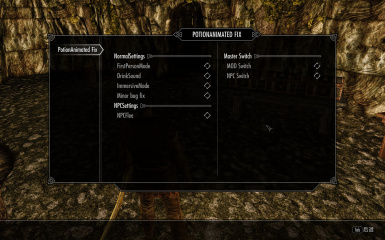 This mod will work with all the restoration potions (Health, Stamina and Magicka), cure disease, cure poison potions and vampire's blood bottles. FNIS: Please run it after installing Potions Animated Fix. 1.Add a MCM menu. Including a switch of this mod and some other options. 2.Make the sound and light effect appear in correct time, adapt for the animation. 1.PLEASE ACTIVE THIS MOD IN MCM AT THE FIRST TIME. 2.If you already use the original mod or flee version, please start a new game, or make sure you know how to stop their scripts and make a clean save. Then you can overwrite them by this mod (we make our files have same names as theirs). 3.NPCs still will NOT be animated, because both of us don't know how to add the animation to them like tktk's Ultimate Combat does. If someone knows how to do that, please let us know. In 1.20 they can do that. 4.Please use hotkeys to drink potions to have the best experience. 5.Due to Skyrim itself, animation can't work while jumping or falling. 6.If you're shacked, knocked down, blew away or something else interrupt the animation while drinking, you may have chance to get a BUG that makes your character cannot attack. You can tackle it just by changing your weapon. My partner has made some protective settings to "fix" this situation, but, still, try to protect yourselves while drinking. 1.Compatible with anything except for those mods which change potion effects. If you have some of them, please make sure this mod is below all of them, or you may have some strange issues, such as the NPCs won't drink potions and the potion effect works twice. 3.Requiem patch. Thanks to ilovecarpet. Pull them to Data, or use any mod manager you like. Turn it off in MCM, and remove all the files about this mod. and any combat enhance mod. You can skip to 00:50 to see the animated potion. Only English (main file) and Simple Chinese (optional file). *To be honest, FB does all the main works, but he won't post by himself at all.